Will Lingual Braces in Putney Work For Me ? When people first contact the Alkali Dental Studio in Putney to ask about Lingual braces, one of the primary questions they ask is whether it will work for them. Many men and women in their early twenties through to their late forties have wished for straighter teeth but the technology hasn’t been around to help us. Until now. It’s amazing how much importance we place on our teeth and it’s always good to discuss potential concerns regarding the procedures and treatments we offer beforehand. Read on below for some insight from the team on what you can expect should you choose our Putney-based dentists. Am I suitable for Lingual braces? It really does depend on the individual. The purpose of the consultation appointment is to take a closer look at your teeth and your bite, and from there we are able to advise whether or not you are a good candidate. 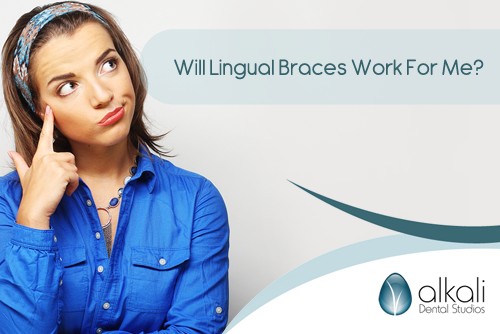 Most patients can benefit from Lingual braces but there are a few exceptions. There are some conditions such as overcrowding where Lingual braces are not as effective and generally not used. You also need to have reasonably healthy gums and teeth (as with most orthodontic procedures). The good news is that your dentist will be able to assess and advise you which is the best way forward for you. The answer to this is categorically no. Usually as we get older we simply get used to having crooked or misaligned teeth. The reason that we don’t try braces is that we’ve decided our teeth will always be the way they are or we associate braces with ugly metal ‘train tracks’. Lingual Braces are Invisible! They are are fixed brackets that go on the back of your teeth. One of the advantages of this design is that they can’t be seen – you can’t see them from the front. There are also plenty of health benefits with having your teeth straightened. Misaligned teeth can suffer from more wear and tear, because your bite is skewed and gaps can give bacteria and plaque more chance to get at the enamel and cause decay. What lifestyle changes will I need to make while wearing the braces? The most obvious adjustment is to be extra careful of what you eat. You’ll need keep up with your cleaning your brace to avoid any problems with your cavities, but once you get into the habit of doing so it won’t be much of an issue, as long as you see a dentist regularly. Will people be able to tell…. This is what we are asked by many patients. The answer is easy. You’ll look the same as you do without them in, you needn’t worry about any severe changes occurring while the treatment is in place. Will it change the way I speak? Lingual braces, like other devices, will have an effect on the way you speak and this will differ from person to person. In most cases it is hardly noticeable but if you spend a lot of your time communicating and work in an area like the media you may want to take some more advice from your dentist. Do I need healthy teeth? Your teeth will need to be as healthy as possible but this can all be determined in your first consultation. After you decide to go ahead, we will check that your teeth are healthy enough for you to be able to have the treatment. Moving your teeth into slightly different positions sounds as if it could be quite painful. The truth is this is done very slowly and you should hardly notice any discomfort. There may be some in the first few days or couple of weeks but this will die down as you become used to the braces. The time it takes for your Lingual braces to work is going to depend on the amount of work that needs to be done. A simple realignment could be complete within a few months whilst a more complex one could take longer. If you thought that straighter teeth were beyond you then you’re in for a surprise. Contact the Alkali Dental Studio in Putney today to find how we can fix your smile without anyone knowing.